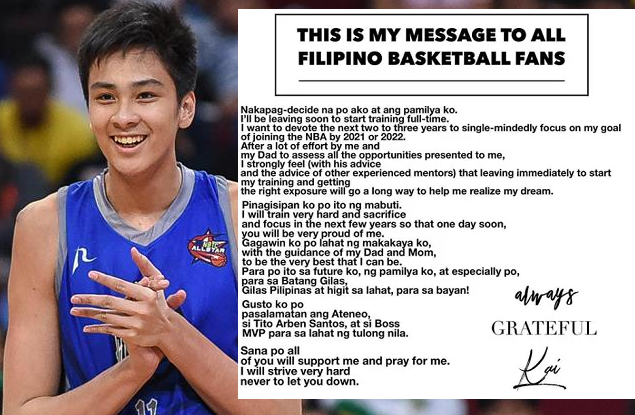 The 16-year-old Kai Sotto announced earlier in his IG story his plan to follow the path going to his NBA dream. Sotto will be leaving soon the country to start a full-time training overseas. Nakapag-decide na po ako at ang pamilya ko. I’ll be leaving soon to start training full-time,” Sotto wrote a promising note in his IG post. Sotto who played in Ateneo for two years and led the school to two Finals appearance has been highly-anticipated as various clubs in Europe had expressed interest in him. "T want to devote the next two to three years to single-mindedly focus on my goal of joining the NBA by 2021 or 2011," Sotto further explained. “Pinag-isipan ko po ito nang mabuti. I will train hard and sacrifice and focus in the next few years so that one day soon, you will be very proud of me," Sotto vowed. Sotto was named UAAP Season 81 Juniors Most Valuable Player(MVP) lifting Blue Eaglets to a runner-up finish in his third year.